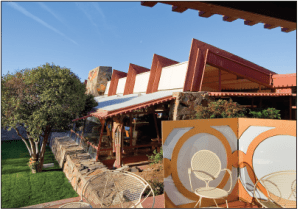 When a physician advised 70-year-old Frank Lloyd Wright to find a gentler clime to escape from the harsh winters of his beloved Wisconsin, he naturally turned to his other love: Arizona. Years earlier, in the late 1920s, he’d spent considerable time there, first as consulting architect on the Arizona Biltmore Hotel, then designing the magnificent but ill-fated San Marcos in the Desert—a luxury resort (near present day Chandler) he believed would out-shine the Biltmore. As he planned and sketched, Wright lived outdoors in a temporary encampment (named Ocatilla for a favorite plant), reveling in the rugged desert life, drawing on brown butcher paper to reduce the sun’s glare. He studied every rock and rise on the site of his future desert masterpiece, a sprawling complex that would blend organically into the San Tan Mountains behind it. The plans were finalized in 1929, but abandoned in October with the Wall Street crash. Wright’s only major project at the time and said to be among his favorite designs, San Marcos in the Desert would never be built. But eight years later, riding high on the resounding success of the exquisite Fallingwater home in Pennsylvania, he purchased a six-hundred-acre parcel twenty-six miles east of Phoenix. He returned to the arid landscape to make a home in the desert—and not alone. Making the 1800-mile drive with him in a ragtag cross-country caravan were dozens of young apprentices of his bourgeoning architectural school. Perhaps fueled by the failure of the grand hotel in the desert, this would be a second chance to create organic architecture in a hostile environment. And he would do it all, rock by rock, with the muscle of the Taliesin Fellowship. Back in 1932, at the urging of his young wife Olgavinna, Wright had opened the doors of his Wisconsin home to a new concept in architectural education. Incorporating elements of Olgavinna’s experiences as a devotee to Russian mystic George Gurdjieff, the Wrights intended for the Taliesin Fellowship to be more renaissance than school, fostering participation in the arts—music, poetry, performance, dance—not just architecture. And there was one more thing that set it apart from architectural schools: at Taliesin, students actually built things. 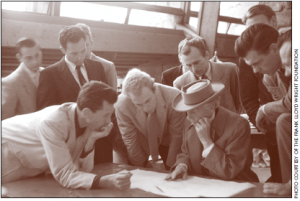 Young people flocked to Taliesin, paying $650 a year for the privilege of studying and working alongside Wright. And did they ever work. The program, while attracting criticism for its lack of structure and formal education, was an unprecedented success. The atmosphere was one of intellectual stimulation, optimism and unbridled devotion to Wright. 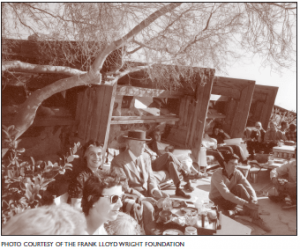 So in 1937, the apprentices cheerily loaded up the cars and headed to the desert to build a school, studio, and winter home for the Fellowship: Taliesin West. “Taliesin” is a Welsh word meaning “shining brow.” First applied to his Wisconsin retreat, the term illustrates how Wright believed a home should be built into a hill, not on top of it. “You should never build on top of anything directly,” he said. “If you build on top of the hill, you lose the hill.” But Taliesin West isn’t nestled gently into the hillside as is Taliesin in Wisconsin. It rises sharply out of the sand at the foot of the McDowell Mountains as if it were always there. 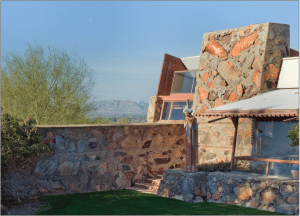 From whatever angle you look, the sharp, angular profile of the complex is “almost brutal,” according to Taliesin Fellowship member Arnold Roy, who still lives and works at Taliesin West. “But it absolutely suits the site. The desert is not very welcoming. Everything is sharp. The way these buildings rise up out of the ground is barbaric—the perfect expression of what needs to be at this site.” Every wall at Taliesin is formed with “desert concrete”—a mixture of sand, soil, and rocks (and even a bit of vegetation) found just yards away from where they now stand. Many of the quartzite rocks were hand-selected and positioned by Wright himself for color and the ancient petroglyphs they display (the petroglyph on one huge rock, called the “Whirling Arrow,” became the inspiration for Wright’s personal logo). Incredibly, the entire sprawling compound was built almost entirely by hand. But then, there were a lot of hands. The first building to be completed was the main compound, including an enormous drafting studio, dining room and galley—not a kitchen, Wright said, but a galley that anchored his “floating ship on the desert.” Rugged redwood beams highlight the beautiful shades of reds and browns on the volcanic rock, further augmented by the floors painted Wright’s signature Cherokee Red. Of course, special attention was given to Wright’s simple but elegant private living quarters. Because the complex was designed primarily for winter use, the private quarters face south to maximize the low angle of the winter sun. But even in summer, the plentiful light is indirect, filtered through opaque panels overhead (originally canvas, now more durable fiberglass) and softened by visors over clerestory lights. Apprentices were chosen carefully, but academic ability was not the only yardstick by which they were measured. Musical or artistic talent was of supreme importance to the Wrights; an applicant’s ability to sing, dance or otherwise entertain was always looked upon favorably, and sometimes garnered a scholarship. (Though the inside joke was, to be an apprentice, you needed a hammer, a sleeping bag and a tuxedo.) In the early days, apprentices slept in the open desert in what were known as sheepherders’ tents. And apparently, they loved it. As the Fellowship grew, relationships formed, and naturally marriages (and the need for privacy) followed. Couples were sometimes given a space to build their own small quarters. Arnold Roy built his home in the late sixties after he married, and still lives there today. A practicing architect, Roy’s office is in the main building. He says, “My commute is about 350 feet.” Susan Jacobs Lockhart is another senior member who built her own home on site. 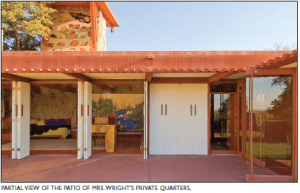 She says Frank Lloyd Wright “is in my DNA.” (She first met him when she was three; her parents, Herbert and Katherine Jacobs, commissioned the first Usonian house in 1936 as well as the Solar Hemicycle House in 1943. Both wrote books detailing the experience.) 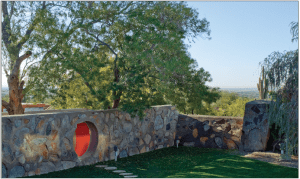 She now lives part of the year at Taliesin West in the 450-square-foot home she and her late husband Kenneth Lockhart designed and built, taking to heart Wright’s advice to look to nature for inspiration. Susan says its mindful design lends a sense of well-being, of proportion to her surroundings. “The smaller spaces are aligned with the scale of desert foliage.” Today, Taliesin West is home to the Frank Lloyd Wright Foundation, which works to promote and preserve existing works of Frank Lloyd Wright. 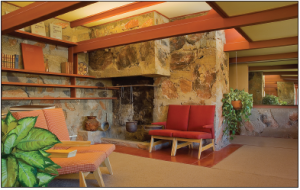 It’s also home to Taliesin, the Frank Lloyd Wright School of Architecture, and to several of the original members of the Taliesin fellowship. The school is infinitely more structured than in its pre-accreditation days, but the sense of community is still central. The twice-weekly formal dinners followed by entertainment are now just monthly, but students still share their musical talents. And the remaining members of the Taliesin Fellowship, some of whom are now in their seventies, eighties, and even late nineties are on hand to mentor the young students and share their experiences of living and working alongside one of the world’s greatest architects.